The most common cause of a leg sprain in dogs is trauma or injury. If a dog is severely injured due to an automobile accident, falling, attack, high jump, fight or anything, joint ligaments may get stretched and when stretched, then can become ruptured or twisted, ending with a sprain. Other then trauma or injury, some other myopathies may also cause a sprain to occur. Chronic and progressive degeneration of muscular and ligamentous parts of the body due to any non infectious and congenital (inherited) disease can cause weakness in a dog's strength, where the mild stretching and pulling can lead to a sprain. This type of dog sprain is more common in older dogs. Sprains are often seen in the limbs and a dog paw sprain can even occur. Dogs with a sprain may show symptoms such as lameness, limping, pain, stress and swelling. These are the most common symptoms; more severe symptoms in advanced forms of a sprain may also be noted such as complete immobilization, shock, severe stress and possibly, aggressiveness. Level I: This is the mildest form of a sprain in dogs. The minor part of a ligament is usually torn. A dog can still walk, but cannot run or jump. Swelling and pain are noticeable, but usually do not cause many dog walking problems. Level II: In this form, part of the dog ligament is torn and stretched. Bones remain intact, but severe swelling and pain along with lameness is noted. Dog with this type of canine sprain may not be able to walk properly, and joint function is termed, “abnormal”. Level III: This is the most severe form of dog sprain. 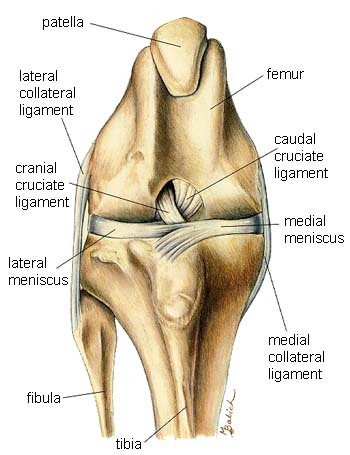 The joint ligament is severely damaged, and is completely torn. Bones forming the joint do not remain intact, many researchers believe that this form should not be considered a sprain. Clinical examination and X-Rays are only ways to diagnose a canine sprain. In order to describe the form of sprain, it is necessary that a veterinarian examine the sprain in detail. Sometimes, local anesthetics are required for a detailed clinical examination. X-Rays and arthroscopy are other ways of making a diagnosis. The arthroscopy will provide images of torn ligaments and joints from different angles. These types of images are required to confirm the status of the joint, ligaments and sprain. Both a clinical examination and x-rays are necessary in order to determine a proper treatment and proper handling of an emergency, if it exists. Each form of a canine sprain is treated in different ways. Most commonly, specific drugs, such as anti inflammatory drugs and pain killers are required to be administered for managing pain and possible inflammation. Confinement and restriction of movement is a necessary part of treatment, even in some very mild forms of sprain. In severe cases surgery is required, especially in Level I and II forms of sprain. Parts of torn ligaments are removed and then the joint is restricted from movement with the help of surgical techniques. Splints are most commonly used for immobilization of the dog leg joint. Critical care and management is required for complete recovery. A dog sprain may take a couple of weeks to several months to heal, depending upon age, immunity and health status of an affected dog. Along with a specific treatment with drugs and surgery (if needed), natural remedies such as Muscle and Joint Support Formula may help to enhance recovery and musculoskeletal strength of an affected dog. These hasten recovery, which is important since affected dogs may lose interest in eating and drinking, something commonly seen in such dogs as the result of stress.